This book is a quick read, charming and adorable and exciting and mysterious. I don't know that this is a common literary combination, but it should be, because it's a recipe for success as far as I'm concerned. I couldn't resist asking the questions, though, because this book is frankly more his speed than mine. The narrator, Clay, is an unemployed Californian whose only prior job of note is a stint as web designer for a startup company called NewBagel. He finagles a job in a mysterious bookstore, after agreeing to abide by the rules dictated by the owner (Mr. Penumbra, of course), the most important of which forbids him to look in any of the books in the back of the store. It turns out the bookstore is really a front for a strange lending library, frequented by eccentric elderly people at all hours of the day and night. They're working on a serious mission, trying to break a code set down hundreds of years ago, but what exactly are they hoping to find? And more importantly, what if modern technology were applied to the code? Clay happens to meet a cute chick named Kat, who happens to work at Google, and therefore has at her fingertips both the knowledge and the hardware to solve the puzzle once and for all. However, there are conservatives within the movement who don't want computers anywhere near their code, and even Google's computers may not be able to master the intricacies of it. Clay just might have to solve this one himself, the old-fashioned way. This book is so fun to read. A little techno-speak, a little light romance, a big mystery with a charismatic enigma at its center—what's not to like? It's been a while since I've read a book in which the entire cast of characters was so delightfully weird and endearing. 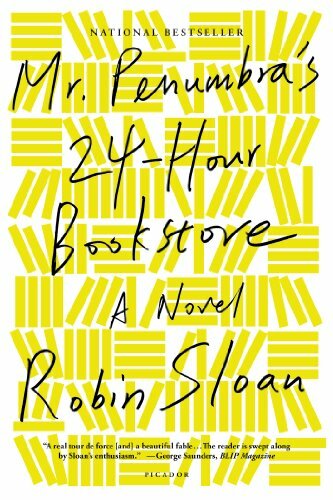 Bottom line: Read this book, and redefine your idea of what a bookstore really is.